Below are common attributes associated to Marigolds - African. Become a care taker for Marigolds - African! Below are member comments regarding how to plant Marigolds - African. No comments have been posted regarding how to plant Marigolds - African. Be the first! Do you know how to plant Marigolds - African? Below are member comments regarding how to prune Marigolds - African. No comments have been posted regarding how to prune Marigolds - African. Be the first! Do you know how to prune Marigolds - African? Below are member comments regarding how to fertilize Marigolds - African. No comments have been posted regarding how to fertilize Marigolds - African. Be the first! Do you know how to fertlize and water Marigolds - African? Below are member comments regarding how to deal with Marigolds - African's pests and problems. 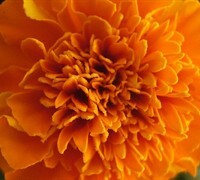 No comments have been posted regarding how to deal with Marigolds - African's pests and problems. Be the first! Do you know how to deal with pests and problems with Marigolds - African? Looking for Marigolds - African? Marigolds will benefit from deadheading though it is not necessary. Just snip faded blooms off with a sharp pair of pruners or scissors. Doing this not only makes the plant look nicer, it encourages more blooms. For best performance, feed marigolds with a long-lasting, slow-release flower fertilizer at time of planting, or every week or two with a water soluble liquid fertilizer.